All are very welcome to join us for the first of this term’s melodrama screening and discussion sessions. We are screening Esther Waters (Ian Dalrymple and Peter Proud, 108 mins) on Monday the 1st of October, 5-7pm, in Jarman 6. 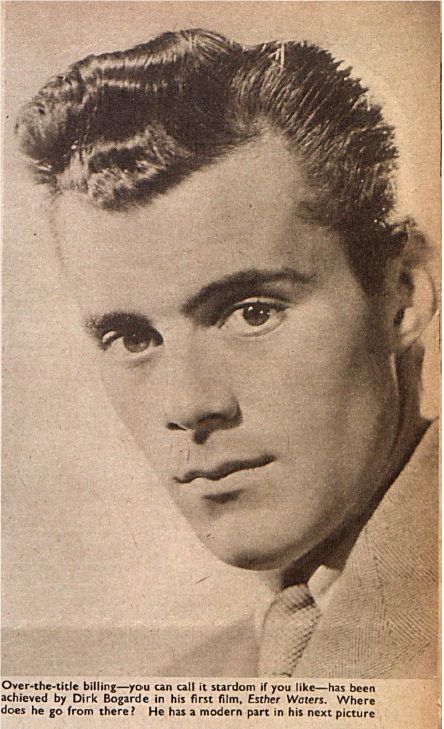 As explained in a previous post, the BFI has very kindly recently allowed me access to its collection of Dirk Bogarde journals. This collection of magazines and other ephemera featuring Dirk was donated to the BFI by the late star’s estate. This led me to think about how focusing on one star, and especially a male one, for a term, may begin to show some of the many facets of melodrama. We are taking a chronological approach, and start with Dirk’s third film, and first credited and starring role. The Victorian melodrama Esther Waters is adapted from the 1894 novel by Irish writer, George Moore. It sees Dirk playing a groom who seduces the heroine, kitchen-maid Esther (Kathleen Ryan), abandons her, is reunited with her, and, predictably, causes her further heartache. Dirk’s earliest appearance in a film fan magazine in the BFI’s journal collection is the feature article ‘Dirk Takes His First Chance’, in the UK’s Picturegoer, on the 23rd October 1948 p. 5 (for the accompanying portrait and caption, please see picture above). This would have been available to readers by the date of Esther Waters’ release (22nd September 1948). The article is strangely ambivalent about the quality of the film (though please don’t let that put you off!) Its subheading observes that ‘[t]he picture itself was given only a mixed reception from the critics and judgment on the young man has to some extent been suspended until his next can be seen. All the same, his work in “Esther Waters” shows promise and imagination. Dirk is convinced he can do it’. While this is less gushing than we might expect from a fan magazine, the very presence of the feature article, and its contents, suggests that Dirk is being built up as a star by the studio he is contracted to, J Arthur Rank. This includes ‘factual’ comments on Dirk’s family and theatre background, and also an insight into his person. He is reported to have artistic tendencies, to be sensitive and shy, although this is balanced by a focus on the bravery he displayed during his war service. We can compare this to later fan magazine coverage of Dirk as we address several of his other films in detail. It will also be worth focusing on the gap between the supposed ‘real’ Dirk and the ‘screen’ Dirk. The article mentions Esther Waters is a ‘good test’ of his talent since he plays a character ‘entirely unlike himself’. We can consider if as time goes on the ‘real’ Dirk, at least the one presented by fan magazines, alters and/or whether his screen image adapts to reflect his star image. For example, the caption to the above picture (from the article) ponders ‘[w]here does he go from there’ and notes that Dirk’s next role will be a ‘modern’ one – the case for much of his career. Do join us, if you can, for the first in our Dirk season.